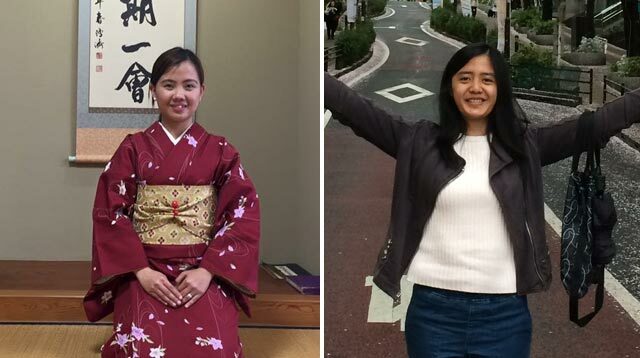 Hear from the first two Filipinos who got accepted into the Japan Exchange and Teaching (JET) Programme. 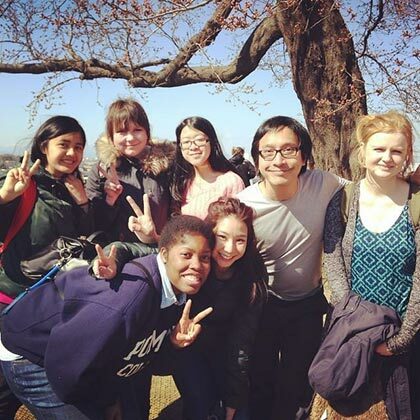 The Japan Exchange and Teaching (JET) Programme was created in 1987 to increase mutual understanding and cross-cultural awareness between Japan and other countries. Participants of the JET Programme serve as cultural ambassadors and Assistant Language Teachers (ALTs). They opened this program to the Philippines in 2014, and Chique Samaniego and Debra Carino were the first two Filipinos who got in. What made you apply to the JET Programme? Chique: Contrary to popular belief, JET isn’t just about teaching English; it’s also about internationalization, which means learning about different cultures. I applied not just because I knew that the program would be an extraordinary teaching experience, but also because I wanted to immerse myself in a completely new world. And it’s been really rewarding. Debra: JET gave me countless opportunities and allowed for first-hand experience and exposure to the many interesting things Japan can offer. Additionally, I was born and raised in the Cordillera Region. I am 100% Igorot. Coming from a community that’s often misunderstood is one of the reasons why I joined this program. It’s the best opportunity and platform to let other people from other countries know more about the diverse cultures in the Philippines. C: I applied to JET in 2014. It was the first time JET accepted participants from the Philippines. One issue I faced during the application process was wrapping my head around what JET actually is. The process was long—there was a ton of paperwork. The application for JET usually opens in October. I gathered all the necessary documents for the application and mailed it to the Japan Information and Culture Center (JICC) of the Japanese embassy in Manila. After a panel reviewed all the documents, applicants who passed the application review stage were invited for an interview and for a short class demonstration. In general, interviews are usually held in February and results are announced in April. Placement notifications are sent in May; this is when you find out where you’ll be moving to. The months leading to departure are filled with putting other paperwork together. Pre-departure orientation is held at the Japanese embassy in August. Why do you think you were chosen out of all the other applicants? D: I think I was able to get into the program because of my genuine interest in becoming a cultural ambassador of the Philippines. Plus, I knew about my culture and my country and expressed my deep respect for Japan’s culture and history. C: When I applied, I had five years of teaching experience under my belt, so I think it definitely gave me a leg up. I showed a deeper level of understanding when it came to teaching. I was also interested in learning about different cultures and languages as tools for career advancement. My eagerness to give back to their community despite the cultural differences as well as my desire to bring something to Japan as a representative of the Philippines helped me a lot. 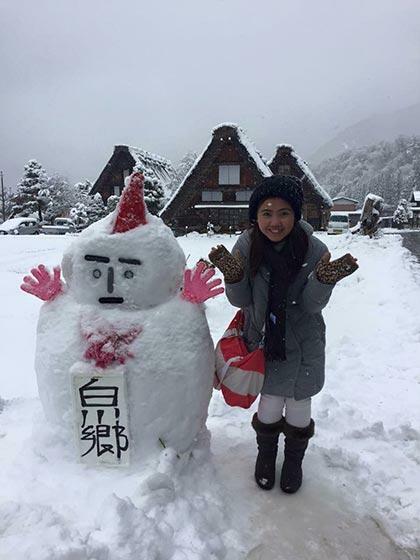 What was the adjustment period like when you first moved to Japan? D: Adjusting to my new life in Japan went smoothly for me. I’m lucky to have relatives and friends here. I didn’t feel homesick at all. C: Fresh off the shinkansen (bullet train) from our orientation in Tokyo, we had two weeks to settle into our placements. I had to be adaptable. I was placed in the rural area, where the locals weren’t as familiar with English, so there was a definite language barrier. That said, I made some communication mistakes. The locals were very patient and helpful, however. Basic Japanese is necessary—and I was more than eager to learn. The teachers I assisted were always busy, so I had to be proactive. But every situation is different. Some ALTs make lesson plans, some don’t. There were times when the lesson plan wasn’t discussed until right before the class started, so I had to be flexible. But the biggest adjustment was understanding the importance of punctuality. Filipinos are always late, but Japanese people are especially concerned about being on time. What are your day-to-day tasks as ALTs? D: Work days are mostly busy but always fun. ALT classes are always tackled by two people—a Japanese Teacher of English (JTE) and an ALT. Most of my classes are writing classes so every week, I have a lot of papers to check. In my school, there are two ALTs. I’m in charge of making the lesson plans for writing classes. My co-ALT and I are also partially in charge of the English Club. We have club activities twice a week. In my English Communication classes, I help the JTE by doing speaking drills with the students. Sometimes, I also judge speech contests both in my school and in other schools. C: Specifically, the duties of an ALT at school are to assist the JTE in developing students’ communicative abilities in English. An ALT is also meant to serve as a cultural resource person. I have to assist with classes taught by the JTE, prepare supplementary teaching materials and lesson plans, help out with foreign language speech and presentation contests, and manage the English Club. In addition, I handle the morning listening quiz three times a week. What are the perks of being in the program? D: Being in the program gave me opportunities to build good relationships—with my students, but also with the entire community. My experiences are ones that can’t be recreated by a travel guide. C: Immersion is one of the greatest gifts I’ve gotten out of this experience. And JET has been very good to me. For one thing, JET offers a higher salary than similar programs across Japan. So I’m not only given the experience of living in Japan, but also the means to enjoy it! I get to travel and explore. This program has also given me a wonderful support system—both professionally and personally. What are the most common misconceptions? C: One of the most common misconceptions is that the participant works for the JET Programme. JET is basically a recruiting program and support network. The program has no power over the participant. My contracting organization or the school was the one who hired me. Another misconception is that you get free housing. The contracting organization assists in finding you a house, but participants are responsible for the rent. Lastly, participants assume that there are instructions for everything and that they’ll be guided through the whole process. FALSE. After arriving, many participants find that nobody tells them anything. You have to figure it out on your own. How does your compensation compare to what teachers make in the Philippines? D: Truthfully, I’m not sure how much teachers are paid in the Philippines, but what we earn is definitely bigger. This doesn’t mean, however, that I’m just rolling in money. I pay all my bills—with taxes and healthcare fees, too. The cost of living in Japan is also significantly higher. D: Japan is not just about anime, ramen, matcha, and Tokyo. The country has more to offer. In terms of work, the system is different here. Don’t be surprised or offended if your suggestions are not approved. Your transition into your new job will be better and easier if you observe how they do things first. Lastly, if you don’t understand something, just ask. C: JET is challenging and living abroad is not for everyone, but if you want to live and teach in Japan, it’s a challenge that is well worth the effort. There are so many things to do and ways to spend your time here. JET can help you create your own Japanese experience. Just be yourself, and think hard of what can you offer Japan and its people. It's important to show interest in cultural exchange.